Michael McGaghie D.M.A. is Assistant Professor of Music and Director of Choral Activities at Macalester College and conductor of the Harvard Glee Club Alumni Chorus. He conducts the Macalester Concert Choir and Chorale and teaches courses in music history and criticism. An active adjudicator and clinician, he has served as chorusmaster of the Minnesota Bach Ensemble and as regular guest conductor of the Twin Cities ensemble Singers in Accord. He sings tenor as a member of the Minnesota Beethoven Festival Chorale. The American Choral Directors Association has frequently recognized his work. Under his direction, the Macalester Concert Choir was chosen by a double-blind audition to perform at ACDA’s 2016 North Central Division Conference. He was one of seven American conductors selected for the ACDA International Conductors Exchange Program in China, where he conducted several student and professional choirs in greater Shanghai. His doctoral thesis on Minnesotan composer Dominick Argento received ACDA’s Julius Herford Prize, awarded annually for the nation’s most outstanding dissertation in choral music. Deeply committed to undergraduate education, Dr. McGaghie previously served on the conducting faculties of Harvard University and The Boston Conservatory. His teaching has received multiple awards from Harvard’s Derek Bok Center for Teaching and Learning. He holds degrees from Harvard College and Boston University, and he remains a proud member of Red Sox Nation. 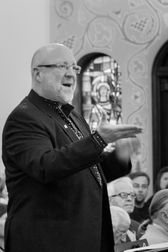 Timothy Sawyer is a widely known conductor and educator, and a veteran of many professional choirs, among them the Dale Warland Singers, the Oregon Bach Festival Chorus, the Ensemble Singers of VocalEssence, and the award-winning South Dakota Chorale. Sawyer's conducting teachers include Helmuth Rilling, Eric Ericson, Gregg Smith, Vance George, Margaret Hillis, and Dale Warland. 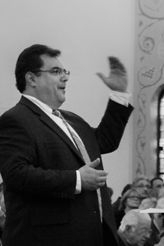 He has conducted choral performances throughout the United States, Europe and South America, and for state and divisional conventions of the American Choral Directors Association. Active as a festival conductor, he has led all-state and honor choirs throughout the United States, and internationally in Hungary, Germany, the Czech Republic, Ukraine and China. From 1997–2004, he was associate conductor of the Minnesota Chorale, preparing choruses for performance with the Minnesota Orchestra and Saint Paul Chamber Orchestra, and since 2004 has been Artistic Director and Conductor of the Two Rivers Chorale, a St. Paul-based chorus. Since 1989, he has been a member of the music faculty at the University of Northwestern-St. Paul, where he is Professor of Music and Director of Choral Activities. Sawyer is cited in Who's Who in America, Who's Who Among America's Teachers, and shared in a collective Grammy Award in 2000 with the Oregon Bach Festival Chorus. He served on the board and planning committee for the Sixth World Choral Symposium hosted by Minneapolis/St. Paul in 2002. For several years, he served on the artistic staff of the Toronto and Oregon Bach Festival's conducting master classes, and has taught conducting in music academies across Ukraine. 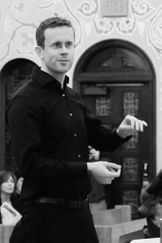 Active as a choral clinician and festival conductor throughout the United States, Europe and Asia, he has been a guest conductor of the Byzantine Choral Festival since 2014. Yuri Ivan D.M.A., completed his formal music training in Ukraine where his primary teachers were Jarema Skybinky and Mykola Kolessa. Mr. Ivan also studied with Yuri Simonov, Adalberto Tonnini, Vjacheslav Blinov and Yuri Lutsiv. After graduating from The State Conservatory of Music in Lviv, he served from 1996 to 2000 as an Associate Conductor atThe State Theatre of Opera and Ballet in Dnepropetrovsk, Ukraine, where he conducted productions including The Marriage of Figaro, Rigoletto, La Traviata, Carmen, Pagliacci, Eugene Oneguine, Die Fledermaus, La Fille Mal Gardee, Giselle, Don Quixote, Swan Lake and Sleeping Beauty. In 2001, Mr. Ivan was named Artistic Director ofTrans-Carpathian Philharmonic, co-founded the Uzhgorod Youth Orchestra, and the Young Virtuosi music festival in Ukraine. He also appeared with LVMI Opera, the National Symphony-Pops Orchestra of Ukraine, the National Broadcasting Company Orchestra of Ukraine and the Northern Hungarian Symphony. Mr. Ivan completed his doctoral studies in conducting at the University of Minnesota where he studied with Akira Mori and Craig Kirchhoff. 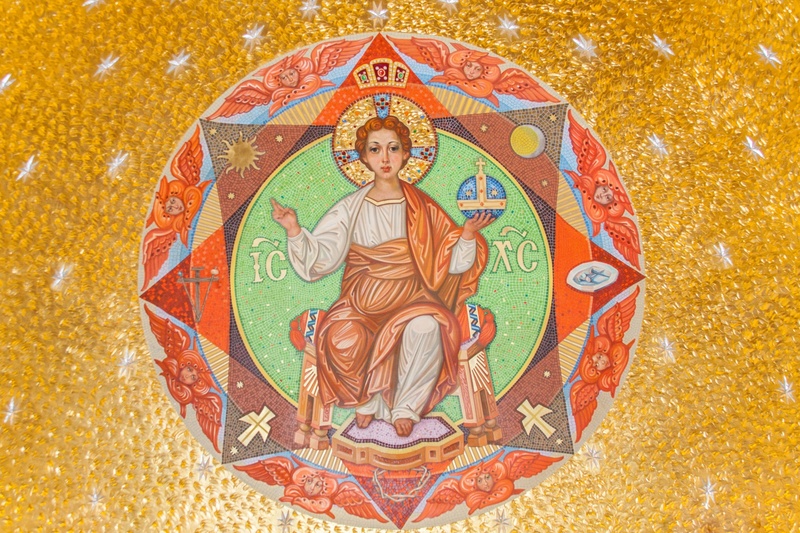 Currently, he is the Music Director at St. Constantine Ukrainian Catholic Church. Dr. Ivan is active in the artistic life of the Twin Cities metro area, collaborating with a range of artistic and educational organizations as the Twin Cities Fringe Opera, Minnesoda Concert Opera, Eu Claire Chamber Orchestra. Since 2006, he has served as Music Director of the Linden Hills Chamber Orchestra. Since 2007 he has served as the conductor for the Metropolitan ballet and Artistic Director of the Kenwood Symphony. Yuri Ivan founded the Byzantine Choral Festival in 2009.